In today’s New York Times is an article explaining how they are going to open their archives and web site up – sort of. It is indeed great they are taking away the requirement of logging in to see articles, and they are allowing free access to the “TimeSelect” service (previously $8/month). In addition to opening the entire site to all readers, The Times will also make available its archives from 1987 to the present without charge, as well as those from 1851 to 1922, which are in the public domain. They put this out there like it does not require any explanation. As though no one might care about what happened between 01922-01987. I would think that the time frame encompassing such events as Prohibition, The Great Depression, World War II, and the conflicts of Korea and Viet Nam might be worth at least a footnote. I would venture that what happened was Steamboat Willie. The first appearance of Mickey Mouse was in the twenties, and therefore the de-facto line in the sand drawn through our culture, from which Disney will never allow Mickey (and by default, anything else) to fall out of copyright. The Disney copyright lobby has done much to keep copyright increasing by more than one year – per year, in order to keep its “intellectual” property safely in their hands. 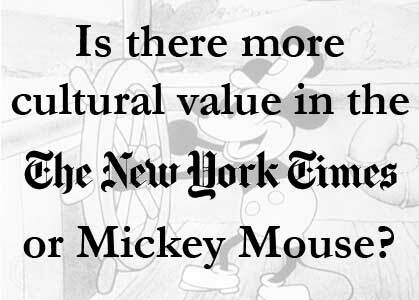 While I am certainly fine with Disney continuing their reign over the little mouse, depriving the rest of us of works of great cultural value, such as 62 years of The New York Times, during some of the most formative years of our nation seems a bit out of whack. I would assume that after 01987 The New York Times is able to attribute all its work and photos in accordance with modern copyright laws, and therefore are able to offer that (which is actually no small feat). But for the 62 years of unsharable data, there is apparently no good solution. The question that this begs in my mind is… What is more valuable to our culture? An make believe mouse, or 62 years of The New York Times? This 62 year copyright gap does a nice job of pointing out where our intellectual property laws have become so onerous, that a large and venerable institution such as The New York Times simply cannot clear the rights in their own archive. Much smaller groups and individuals are in an even worse bind, we have lost great pieces of cultural history to this problem such as “Eyes on the Prize“. I wonder what people will think about this time far into the future? A dark ages — not created by war, famine, depression, or even technological failure, but a small whistling mouse.